People in prison are some of the most vulnerable in terms of access to justice; as part of Kituo’s Advocacy, Governance and Community Partnership Program’s goal of indigent and marginalized persons in Kenya having access to justice through legal aid and empowerment Kituo visited the Meru G.K. Prison for a fact finding mission. On the 10th and 11th February, 2016 AGCP’s program officer Nasibo Abagaro visited the Meru GK Prison for consultative meetings with stakeholders to discuss court related challenges inmates face in accessing justice. Some of the stakeholders we met included the Officer in Charge, Human rights officer, Welfare officer, Documentation officer, Duty officer, Court officer, prisoners as well as those in remand . Meru G.K. Prison has 1250 inmates in total, of which 900 are in remand and 350 convicted. According to a fact finding mission, some inmates have been in remand for 8 years still waiting for a decision from the Courts. An example is a Mr. Stanley Gichunge who was charged with murder and has remained in remand for 8 years. According to findings, majority of remandees are accused of petty offences and are 510 in number, followed by 239 murder cases and 81 robberies with violence. Most of those that have been convicted had been charged with sexual offences. Appeals delayed – According to the prison warders, appeals are delayed leading to more remandees in the prison. They noted that cases are many and files pile waiting hearing hence the delay. Appeal fees are a challenge to many – Another challenge faced by the inmates is that most of them cannot even afford appeal fees which makes them stay in prison longer than usual. Lost files – According to the warders, cases of lost files is common in Meru. This leads to most cases not being heard hence a challenge to accessing justice. Most inmates are ignorant of their rights – They also noted that most inmates are ignorant when it comes to their rights. Most of them plead guilty even for offences they would be not guilty of not knowing they could defend themselves and their entitlement to a fair hearing. Witnesses’ not appearing in court – Witness not appearing in court is another big challenge in the Meru Law court. This results to matters being adjourned and the more adjournments, the further the delays thus hindering access to justice. No advocates trained as mediators – There are no advocates trained as mediators hence petty offences still proceed to court instead of applying alternative dispute resolution. According to the warders, if an advocate has been trained on mediation, not all petty cases will end up in court. This will then reduce the number of inmates and justice accessed earlier without courts intervention. Limitations in access to information – most inmates expressed challenges in access to information after arrest. They complained that they are arrested even without explanations and when at the police station, they are charged with crimes they are not even fully aware of. Mentions delays – according to them, most dates of mention in courts are delayed and this becomes a barrier in accessing justice. State counsels not appearing before court – most state counsels are unwilling to represent clients and some don’t even appear in court leaving them stranded. Longer period in remand – some inmates in remand complained of staying for many years in remand. Some explained that they have been in remand for up to 8 years and even more. Some of them find themselves there as a result of lost files and need external intervention in order for them to access justice. Missing witness – Witness not appearing in court is another big challenge with the inmates. This result to matters being adjourned and the more adjournments, the longer the stay in prison. These delays hinder access to justice. It is everyone’s dream to live in a peaceful country and enjoy the protection of its government and enjoy the rights and privileges that there are. Citizenship is a source of great pride for it gives someone a sense of belonging. While holding on to that dream, we got to ask this rather obvious question, WHAT IS PEACE? The question may sound rhetorical or rather simplistic but its answer may not be that obvious or simplistic. 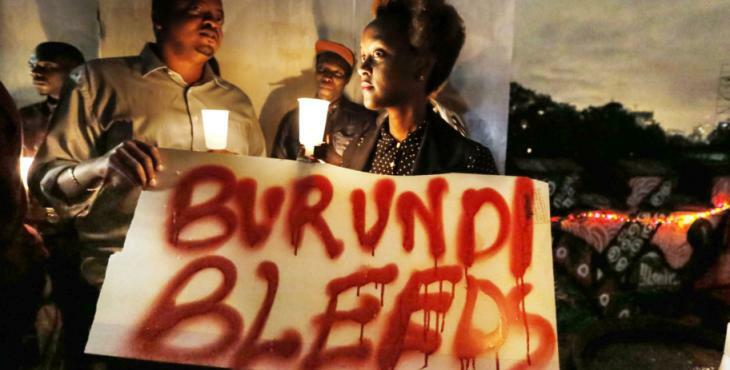 Why you may ask, because Burundi is still searching for an answer to peace. In my search for the meaning of peace I came across two definitions, but I’ll pick one. Peace is “freedom from or the cessation of war or violence.” They say, peace is the greatest asset to humanity and lack of it is the worst weapon and may be a recipe for mass destruction to irreparable proportions. Lack of peace breeds war, hatred, contempt, discrimination, suspicion and evil generally. For those of you reading this, chances are you have not experienced a situation where you have been forced to flee out of your country due to war/violence. Probably the only thing that has made you step out of your country boarders is going for a vacation to a fancy destination or searching for greener pastures. Chances are you do not know the price for war and violence. You don’t know how it feels to walk into a strange country in search for asylum. You do not know how tormenting it is when you meet your persecutors who were after your life even after crossing borders. The point I am making is that the definition for peace in my opinion may be relative depending on an individual and circumstances. Innocent Burundians who have been robbed the protection of their country, have fled into neighbouring countries in search for asylum owing to well-founded fear of being persecuted for reasons of belonging to a particular social group or by virtue of holding a different political opinion from the ruling party/government. It is reported in the news that the government has deployed armed youths affiliated to the ruling party, National Council for the Defence of Democracy (CNDD-FDD) (Imbonerakure youth wing) to hunt down and kill anti-Nkurunziza protestors opposed to the president and his bid for a third term. Out of despair those fleeing are unwilling to avail themselves to the protection of their country or return to their boarders because the imminent fear of persecution. In my line of duty, I have interacted with persons of concern fleeing from Burundi into Kenya to seek asylum. Their stories can only be described as a nightmare bordering scenes of a horror movie. They are running away from an authoritarian leader who has hang on to power and has refused to let go. A leader who once vowed to lead a revolution of peace and change but has instead presided over mass ethnic killings without a care in the world. In Burundi I see a country colonised by a dictatorial regime with insatiable appetite for power. A regime that does not give a damn about democracy. A regime that does not care about its people. A regime that has no listening ear to those who dare give a piece of advice. We are in an era rogue regimes have taken it upon themselves to decide how countries are governed and run. They are the players and referees in their own game. You either play along or you are out. In November 2003, Nelson Mandela while addressing the people of Burundi said, “Do not fail us, do not fail the world. But above all, do not fail yourself and your people. Your country has bled enough. It and its people now deserve enduring peace.” Tragically, 13 years down the line Burundi is still unsettled. Things are just the same, old ways have not changed. The dark clouds are still hanging and the promise of a new dawn is still a fairy-tale. It is a crying shame! While every country and people must work out and find the solutions appropriate to their circumstances, as a continent, Africa has a role to play in ensuring a lasting solution and everlasting peace returns to Burundi. Ironically, Africa has chosen to politicise every situation and blame everybody for their problems without a care in the world. The people of Burundi have been left on their own while Africa has concentrated its energies plotting an exit out of the ICC. Instead of addressing the urgent situation in Burundi the African Union has turned a blind eye and chosen the essay way, to play the victim and swim along to the politics surrounding the ICC to adopt a proposal by President Uhuru Kenyatta for the AU to develop a road map for the withdrawal of African nations from the Rome Statute. President Kenyatta in his wisdom or lack of it (the later applies) is busy rallying African States signatory to the Rome Statute to make a ‘statement’ as it were that reflects Africa’s refusal to be carried along in a system that has no regard for the sovereignty of nations and tramples on the security as well as the dignity of Africans. The proposal to withdrawal from the ICC comes at a wrong time when some African states are is facing human rights atrocities. The question I dare ask, is Africa committed to protect and promote human rights and reject impunity? African governments played a vital role in setting up the ICC and their commitment has ensured that millions of victims of human rights abuses across Africa and around the world have access to justice. A proposal to withdrawal from the ICC will therefore send a wrong signal because it directly contradicts the values of protecting and promoting human rights which is central to the African Union itself. For a moment these values will be washed down the drain by a few countries solely interested in protecting their own leaders, Kenya being one of them. While the politics surrounding the purported withdrawal from the ICC takes center stage innocent Burundians are still hopeless and their only hope perhaps is divine intervention. But I dare say, all is not lost. It is not all doom and gloom. If Nkurunziza thinks working with the opposition is impossible, they need only consider the recent history of South Africa, where former bitter enemies, Mandela and de Klerk established a government of national unity and jointly laid apartheid to waste. If it was possible in South Africa, it is possible in Burundi. If it was possible for Mandela and de Klerk – and the soldiers under their command – it is possible for Nkurunziza. Burundi will not get peace if Africa sits and watches. South Africa did not achieve its peaceful transition on its own. Sustained political, moral and economic pressure by the international community contributed enormously to getting the negotiations going. It is about time that Africa rose joined hands in averting the growing humanitarian crisis in Burundi. Africa cannot sit and watch as an abusive regime dictates the terms of holding itself to power. Africa can rise to protect one of its own. Africa shall rise against war. African can find solutions to its own problems. Nobel Peace Laureate, Desmond Tutu once said “God is weeping because people were made for inter-dependence and love. Hatred is not a natural condition; it is manufactured and propagated by people. It is a condition that can be turned on its head by good leaders.” It is about time that Africa put its act together! Eclipsed in Corruption: Who will Rescue Kenya? Is it not everywhere? Yes, we are talking of corruption, bribery or simply stealing from the forbidden cookie jar. Haven’t we heard cases of graft even in church? In our morgues? Our borders? State of affairs that is normal for the police force. A system that has characterised our politics and leaders. A culture that has darkened our ministries and government institution. A reality that has disparaged our value system and moral fabric. Turned our youths into disillusioned dream chasers. An ugly picture that turns back the gains we have made in this country. Corruption stinks! We hereby pause a question; do we need a third liberation? And who will rescue Kenya? In this article we are going to highlight the level of corruption in different arms of government as we invite you to ponder with us as we seek a solution. ‘Justice Philip Tonoi’s bribery claim jolts judiciary’ Is the headlines you see plastered on the face of the newspapers. It is the current wave that has rocked our defenders of justice and what does it mean? What are the consequences? Perhaps to many it is just another scandal, a confirmation of what goes on in the dark brought out to light, but think about it for a minute. The Judiciary as provided for in the Constitution 2010 is not just an ordinary arm of the government; it is the link between the Executive and Parliament. It is the defender of justice and so by any standard it should not just be clean but seen to be clean. The people of Kenya ought to have faith in the judiciary but with such headlines can you blame them? A ride down memory lane educates us that when people lose faith in the court system the results are usually bloody. Moreover, Philosophy tells us that the S.I Unit of measuring the integrity of a judge is that of creaser’s wife, can we ascertain this of the good judge and what about the other six, what does the allegations of over 200 million bribe say about them? It may not be clear to everyone but as far as good governance, the rule of law and integrity go, the judiciary should be the cornerstone of it all but what a shame that we here bribery claims from the highest court in the land. The people tasked with the responsibility of setting the standards, creating a judicial culture. They have indeed gone back on the work. They have spit on the reforms and the millions of tax payer’s money that have gone into cleaning of the judiciary. The Judiciary may not rescue Kenya; they may not help us secure our integrity. They may not have the answers we are seeking. We saw the governor of Nairobi County, Evans Kidero measure how bulky the alleged 202million is, speaking to the poor Kenyans who are not even sure of what they will eat after being convinced that ‘NONE’ can carry such amount. We remember vividly the utterances of the Kiambu governor William Kabogo; “…if they want to take us to court, let them do so. I am ready and I have money to defend myself…” so justice can be bought, it is attainable depending on the amount of money you have! President Uhuru Kenyatta promised a corruption free Government. He swore to turn the tide and run a clean executive but could he be looking back at his words and cursing with frustrations? If this was not a political charade, he must be a very disappointed man. The Executive has had a lion’s share of graft cases .We have heard of the tender irregularities with the $3.5 billion- shillings standard gauge project, the Sinopec deal worth $ 15 million involving David Chirchir as a cabinet secretary Energy. We have read of irregularities inrenting of government land and taking 100 Acres for planting of potatoes by the cabinet Secretary for Agriculture. We saw inquiries involving the Cabinet Secretary of transport. In the trivial ministry of lands, the traditions continued; it was too choking until even the innocent children had to cough it out and vomit the ills vehemently. Kenyans still wait with eager whether the execution of the recommendation by the Ethics and Anti-corruption Commission (EACC) that Charity Ngilu and eight other Ministry of Lands officials should be charged with various criminal offences for allegedly benefitting from the double allocation of the 134-acre land parcel in Karen valued at Sh8 billion. Ngilu is nolonger the CS for lands and none is aware of what is happening at the cookie jar. The labour ministry also had a case to answer, causing the president to change his lieutenants but in spite of these, the determined vice of corruption is still with us.we still have to grapple with the apparent loss of Sh791 million at the National Youth Service (NYS) and now the Sh289 billion ($2.75 billion) Eurobond Scandals that up to date none of the poor Kenyan is aware of what transpired except for the cartels who give story depending on their political allies, ooh poor Kenyans who will be responsible enough to save us from these conglomerate of confusion? Yet we should clarify that these are just the big ice bergs that rare their ugly heads. There is still so much we don’t know. For sure the executive has failed with regard to corruption, and the answers we seek have no doubt eluded them. Parliament has also proved to have their demons when it comes to corruption. Claiming parliamentary privileges powers and institutional privileges they collectively rejected a probe by the anti -corruption agency, not to mention the names of the individual members of both the national assembly and the Senate here but the list of shame was clearly made bare. In fact, every Member of Parliament is said to have put his/her hands into the cookie jar either before or after being the Member of Parliament. What about the county governments? The reasoning behind devolution was to promote accountability and accessibility to the people. The constitution of Kenya 2010 reiterates this stating inter alia that the objectives of devolution include accountable exercise of power, enhance economic development and promote checks and balances. Objectives which are lost the moment we open the cookie jar. How is the state of affairs in the counties? 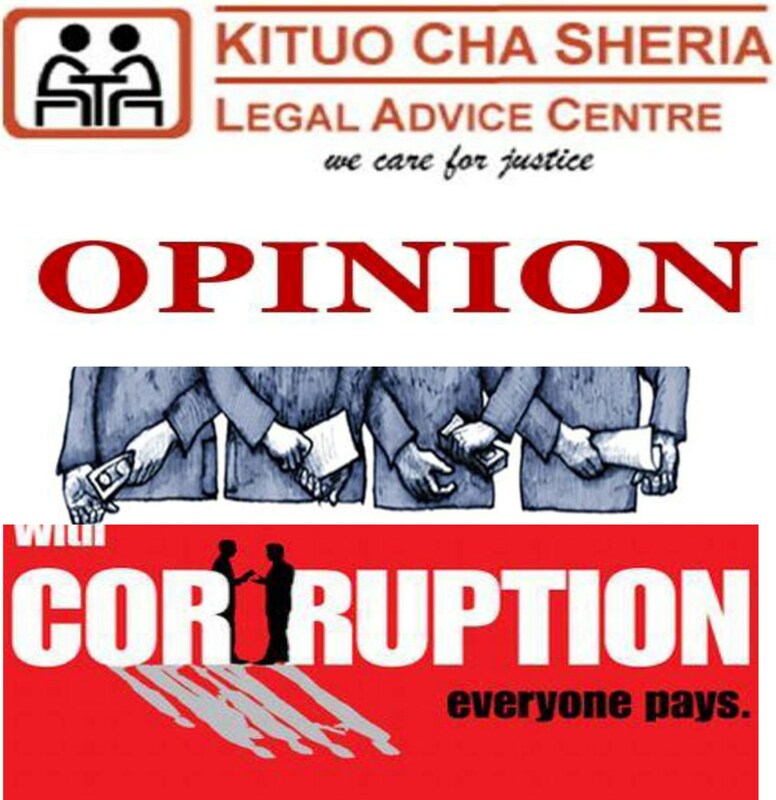 The critics say it is devolution of corruption other than resources .Is it true? We have heard of reports stating irregularities of tenders in Nairobi County, Samuel Tunai being investigated for irregular issuance of tenders, Issac Rutto being questioned on irregular tender processes in Bomet County. There are further reports implicating Cyprian Awiti 200 million pay off of investors in the Agro city project in Homa Bay County. Amason Kingi on the other hand, is investigated for 400 million tender irregularities. The most amazing cases however were the wheelbarrow case in Bungoma where 10 wheelbarrows were procured for a total cost of Ksh.1.09million by the county government and the Kirinyaga County Governor, Joseph Kirunyu Ndathi, who was alleged to have paid a ‘contractor’ Ksh2million to open a Face book page for his county. No need to mention many other projects in the various counties that have gone down the drain. Please also remember that a lot of tax payers money has been used to fund trips for the MCA’s that do not necessarily change the pathetic economic state of most of the counties. No wonder some senators have shown interest in governorship come 2017 general elections! Does the civil society have a role? Questions linger over the strength of the civil society. It is a big shame that these institutions that played a big role are today descending voices. It is very painful that the civil society is a breeding place for people with political ambition and an eye for public office. We therefore need them to awake from slumber and not merely be seen but they need to be heard and to enforce accountability and integrity. The other avenue we could look at is institutionalizing government. Creating independent offices that enforce the rule of law and order. Looks good however, we have also heard the office of the DPP accused of irregular tendering process. Who is to investigate and prosecute this? Indeed we are in an eclipse, the Shepard seems has turned against the sheep. Meanwhile, we are shackled with anti-corruption commission that is only but an ideological institution operating on the whimps of politicians. Where will the solution to corruption come from? Where will get the light to illuminate this eclipse? Should we eliminate these fiend ‘angels’ but how? Can we have a chance with a citizen’s revolution? Ouma Kizito Ajuang’, Lawyer, LAED. Posted on February 10, 2016 February 10, 2016 Categories UncategorizedLeave a comment on Eclipsed in Corruption: Who will Rescue Kenya? “Our lives begin to end the moment we begin to stay silent about things that matter” – Martin Luther King Jnr. If you were asked, what is the most desirable Chapter in the Constitution of Kenya 2010? What would you say? I know there may be no easy answer to this question but I would pick Chapter Four on the Bill of Rights. Arguably, the Bill of Rights is the fulcrum of this Constitution. It is a point of convergence for the leaders and the citizens of Kenya. Moreover, the Bill of Rights signifies a big departure from the past. Unlike the previous document, the Constitution of Kenya 2010 inter alia embraces principles of inclusivity. The law has deliberately recognized women, the youth, marginalized groups and persons with disabilities and bestowed upon them a myriad of rights which include social, political and economic rights. But if I may ask, where are these rights? As a person with physical disability I can’t help but ask these questions? Where are the rights for persons with disabilities? Were they just written to make the supreme law attractive? Was it just about the referendum? Or is it a matter of appeasing our conscience that at least we have persons with disabilities recognized by the law? Please walk with me through this paper and perhaps you will see the genesis of my frustrations. Firstly, the Constitution of Kenya 2010 provides for access to justice. An interpretation of this article is that citizens of Kenya have a right to justice. Legal scholars are quick to look at this provision from the technical point of view, that is, the right to approach the court through pleading, have a hearing and get justice. What of the literal meaning? My experience- while undertaking judicial attachment about four years ago- is that most of our courts in the magistracy level have no ramps. Their entrances are poorly designed and have no allowance for a wheelchair user. I wouldn’t want to talk about other facilities such as the washroom but I guess you get the picture. So, what justice can I get if the courts have not taken initiative to put infrastructure in place? What justice does Article 48 promise if I can’t get into a court room using my wheelchair? I have always asked myself whether the Chief Justice or even the Registrar of the High Court is aware of this. How many resources would it take to build a ramp at the entrance of a court building? Other government offices are no different especially at the county level, yet we pride ourselves with the provisions of Article 54 of the Constitution of Kenya 2010. Secondly, there is a right to access to educational institution for persons with disabilities. How many primary and secondary schools have facilities for persons with disabilities? How many public Universities are ‘disabilities friendly’? Thirdly, the Persons with Disabilities Act Cap 133 of the laws of Kenya establish a National Council for Persons with Disabilities. A brilliant idea you would say; Section 7 of the Act outlines a number of functions given to the council. (1) They have a role to ensure that there are equal opportunities in education and employment. Unfortunately that is only on paper. So far we have deliberated over a lack of facilities for persons with disabilities in schools and offices. How are they to ensure equal opportunity in education and employment yet they do not take steps to sensitize the public and making sure that educators and employers have a disability friendly environment? I can’t help but wonder how much money and resources it would take between the ministries in charge of education, labour relations and the council of persons with disabilities to make this a reality. (2) The National council has a role to register persons with disabilities in Kenya. This is with the aim of helping the government plan for the welfare of these people. How do they do this? If you were in Nairobi, you have to go to the council offices in Westlands; they will send you to Mbagathi Hospital, where you go through medical assessment (which you have to pay for) then go back to the Council with your details and passport size photos. They will tell you to go back home and come after three months to pick your identity card. Interestingly, they most times loose the photos and tell you to bring others. This is a normal process. It makes sense to a man in an omnibus, until you tell them that the subject (this person moving from Mbagathi, to Westlands and to Mountain View) is on a wheelchair and is using public transport in this city of Nairobi! Granted, it may be cumbersome to walk from house to house registering persons with disabilities but I bet it wouldn’t kill us to centralize the process. Put the whole process in one particular place. Statistics which they have should tell them that about half of Persons with disabilities are physically handicapped, translating to mobility problems. Why are the council offices opposite ABC Place in Westlands, with such traffic? How much will it take the Council to automate everything? I feel that the process is not just cumbersome but inhumane. (3) The other roles given to the Council is to provide assistive devices, helping the government develop curriculum, helping with the establishment of rehabilitation centers. These are very good laws but the reality is mind- boggling. Fourthly, there is a provision for civil rights for persons with disabilities. This goes ahead through the Constitution and provides for representation of persons with disabilities in both national and county level legislation houses. The rationale perhaps is that they have a role to ensure that there is disability mainstreaming in the country. Four years down the line and I still see a helpless boy on a wheelchair in Buru Buru for example begging for coins on the streets. Four years down the line, I still know of persons with disabilities in Universities who call-off due to lack of fees. Don’t we still have helpless children hidden away in houses in the villages? What is the need of having disability representatives in parliament while their constituents are going through all these? I am yet to see a single piece of legislation brought to the house by a disabled member of parliament. I am also yet to see any legislation streamlined to fit within the needs of persons with disabilities. Lastly, I will focus on the freedom of information. The Persons with Disabilities Act provides for sign language interpretation in news broadcast and important national events. This is in recognition that there are many citizens in this country with speech and hearing impairment. Does this happen? I know that there are still media houses that do not incorporate sign language in their news bulletins for example. If other media houses have done this, why is it so hard for others? How much money does it take to set up this system and employ a sign language interpreter? Clearly, there is a need to go beyond the law. There is need to implement the law. There is need to create disability awareness. There is need to demand for the concerned sectors to do their jobs properly. It is time for persons with disabilities to demand for their rights. It is time to move from pen and paper to actual realization of our aspirations. I don’t think it is fair that persons with disabilities are fed bread crumbs while we hide behind the veil of legislation. I therefore, urge everyone with or without disability to look at these issues. Seek the truth and help in moving beyond legislation.